Kat arrived fresh from JFK on a Friday and departed on Monday morning, for a fantastic, fun-filled weekend adventure. What perfect timing. Work was at its most chaotic of the year, with International Baccalaureate assessments and paperwork due — super high stakes work. As this was my first time through it, there were a lot of nitty gritty details and stressful aspects (work to be redone, late work, formatting) that I didn’t anticipate. All of us IB teachers were like zombies walking through the day. Usually, Friday arrived and I was relaxed and peaceful with a light schedule, all classes completed by 11:30. 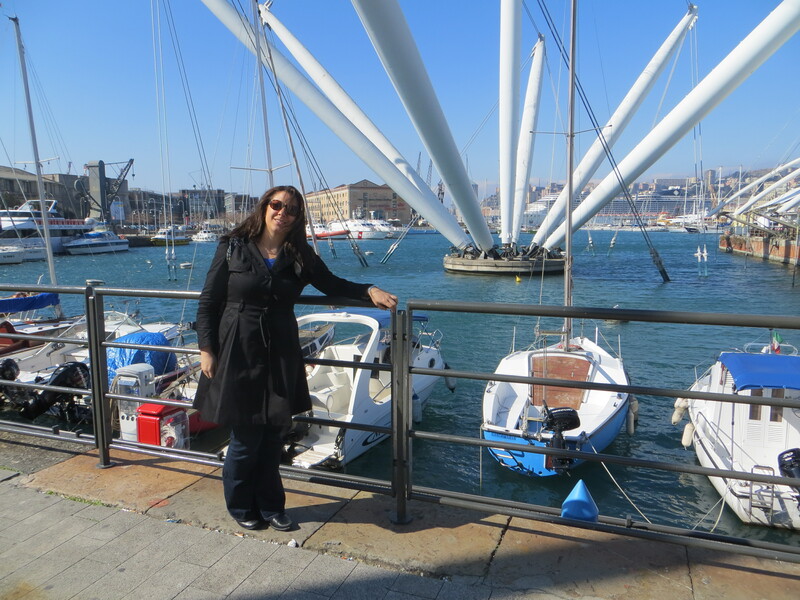 When Kat arrived from the airport, I was in a meeting with a student, and didn’t even have a minute free to run down to the office to notify them of Kat’s arrival fresh from the Genova airport. Luckily, she met the director who asked around and found me. When I exited the classroom with my student, there was Kat’s smiling face. How can she look so awesome and fresh from an overnight flight? Amazing. Originally, Kat said she was up for anything and just wanted to spend time with me. But this was her first time in Italy. She was also a Medieval Studies major (along with Spanish), so I knew she would appreciate a lot of the wonder of Siena and Florence. In the days before her departure, I said, “I have a crazy idea. Want to spend a night in Siena? It’s beautiful. Then we can visit Florence before heading home on Sunday.” When I saw that the train to Florence stopped in Pisa, we planned for that as well. 3 nights, 4 cities. And we did it! I gave Kat a quick tour of the school, which she noted was beautiful. She also asked, “How do you like it with all the little kids?” As a group of 3-year-olds walked by in a neat little line like ducklings. “I love it. It always brightens my day,” I responded. The director had generously given us lunch tickets to enjoy a meal in the cafeteria. I had hallway duty upstairs for the first part, so Kat took the opportunity to meet many of my coworkers, noting that they were extremely sweet, friendly and positive. That truly is the vibe of our school. I joined Kat when my duty was over, and she was in mid conversation about all the wonders of Siena. One coworker said, “You will eat well. This lunch food doesn’t count as your first Italian meal.” It’s ok for school food, but this is true. I walked Kat down to my apartment, which is just minutes from the school, where she settled down for a short winter’s nap, and I went back to work until the end of the day. Back to my apartment, I roused Kat as we prepared for an evening in Nervi, a nearby resort neighborhood along the sea — where I take all my guests on their first night much like the school brought me when I first arrived. 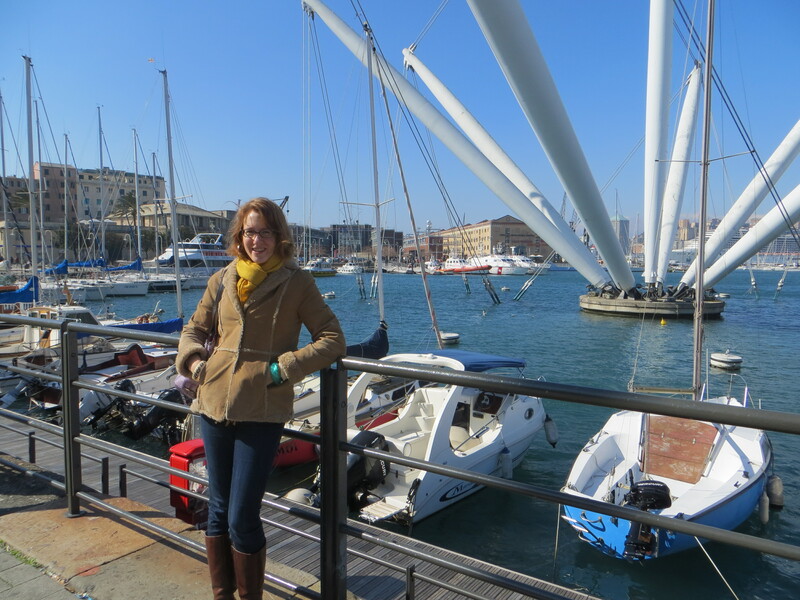 There is no better welcome to Genoa and the Ligurian Coastal beauty. We walked along the passegiata and walked into a quaint seaside restaurant called Chandra, with views of the waves crashing against the rocks. With a slightly Indian vibe, we enjoyed the quaint decor, snacked on the free snacks with our drinks, and then ordered our meal, featuring focaccine (friend dough filled with soft, yummy stracchino cheese). 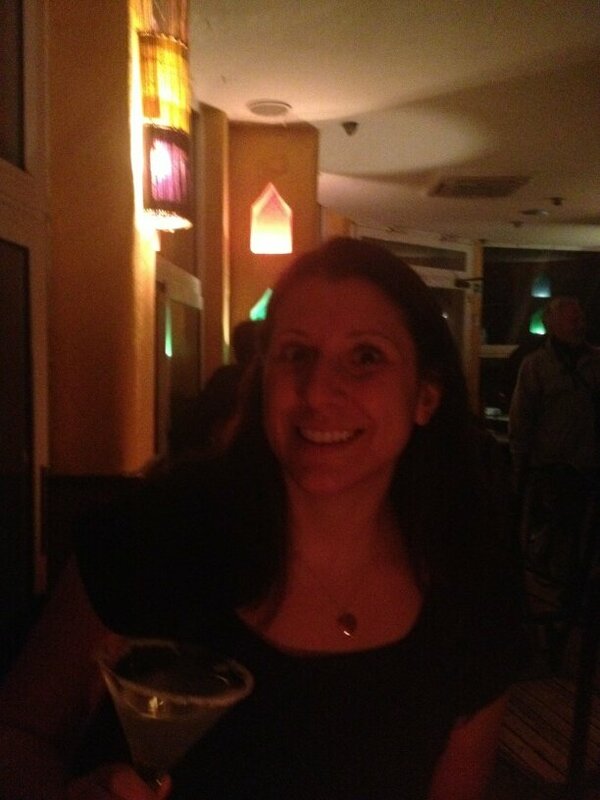 I had chicken tandoori and Kat had a pasta dish, I believe. I’m showing off the beautiful new necklace Kat bought me at the Met as a hostess gift along with plenty of other practical and fun goodies and meals to spoil me. We chatted, caught up, enjoyed the sea, and then enjoyed the live music as it began to play. With jet lag for Kat and general fatigue for me, though, we couldn’t last through more than a couple of songs. Back to Genoa for bed. A big day ahead of us on Saturday. We were blessed with glorious spring-like weather that weekend, with temperatures climbing into the low 60s, a delightful break from the soggy 50s we had in the week leading up to her visit. Saturday morning we had breakfast, then headed into the city to see Genoa. I showed Kat the medieval center, the port, Columbus’s alleged birthplace, and we even had some time for boot shopping . . . while there were some good potential options, we didn’t find exactly what Kat was looking for but we enjoyed the browsing experience. 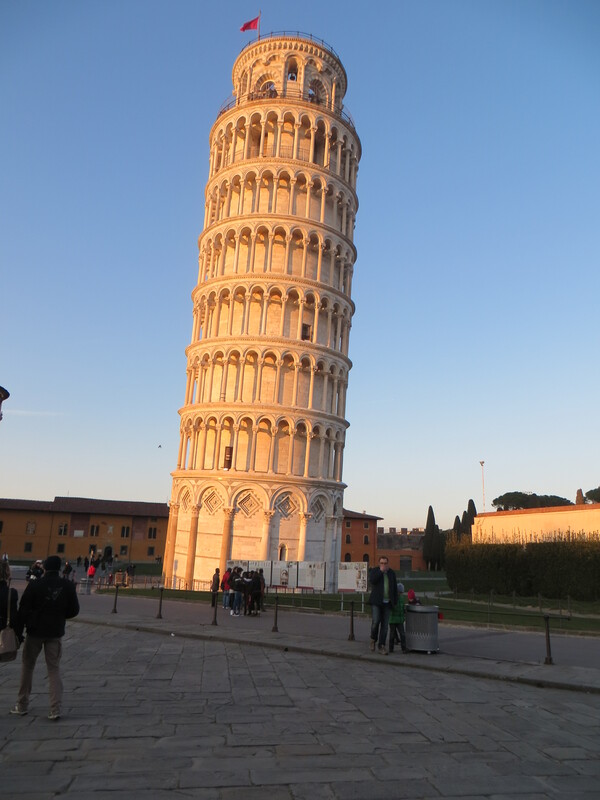 Back on a bus, we grabbed our overnight bags, then back on a bus for Brignole train station, then to Siena via Pisa. I slept most of the train ride, absolutely exhausted from work. Kat began her many postcards (I believe she sent 30 something). The sun was in that glorious golden hour, and with our latitude, it lingers longer than in other parts of the world. We consulted the map, and made a mad dash for the iconic slanted architecture. It leans a bit more every year, and as I had not been since 2004, I could really feel like it was leaning noticeably more. After posing for the obligatory “let’s hold this thing up” pictures, we strolled back through town, past postcard shops and touristy knick knack pushers, back to the train and towards Tuscany and Siena. At one random station, we stopped to get a snack and read the board for our connection. Our train was cancelled! Ahh, Italy . . .always full of frustrations. We had to sit in the station and wait a bit for the next train, but we were grateful there was a next train. We rolled into Siena a bit later than we anticipated, but glad to be there with fresh air and stars peeking out of the inky sky. Having not been there since 2002, I was very pleasantly surprised by the redo of the train station. Previously, you had to board a bus, grab a taxi, or walk up a very long hill to the city, with the station settled at the base of a big hill. But now, they have constructed an elaborate system of escalators and people movers that bring you easily and conveniently to the top of the hill, where you can then stroll through the medieval wall and right into town, all lit up in its serene romantic beauty. We were tired from the travel, but captivated by the magic of the city. Siena is special, and I will always choose staying her over Florence. It’s a popular day trip place, but to stay allows you to experience the real magic when the tourist crowds disperse, and you can wander and enjoy in peace and serenity. Kat had articles from the New York Times Travel Section and she had a recommendation for a restaurant in the main square. We found it, and enjoyed an absolutely delicious meal with a view of City Hall. Then a short stroll just outside of town to our hotel, which we were so excited about. We chose a quaint b&b with 360 degree views of the hillside. Upon arrival at our hotel, we experienced a bit of a snafu. They accidentally gave away our room to someone who arrived looking for a room. The person working the desk was not a regular, so she made a mistake. I was so exhausted and irritated by that point, but Kat works in hotels and knows this can happen. They rebooked us in a nearby hotel in the same area. We ended up with two single rooms, and the rooms were on the road instead of secluded like the other hotel. However, the quality was excellent as was the service. The original hotel was very apologetic and offered us discounts on future stays. So it’s all good — and these things are part of the travel adventure. I slept very well, and we awoke to a beautiful breakfast with views over the hills and valley in the bright sunshine. Delicious. No complaints. Another gorgeous day awaited us. After some photos in the garden, we saw the civic museum with its famous mural. 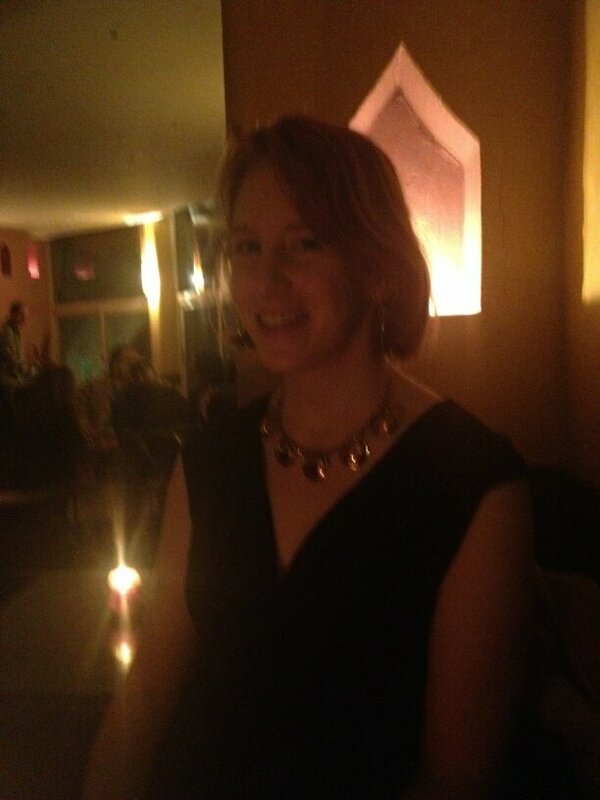 Kat educated and entertained me with her wealth of medieval knowledge, enhancing the experience. We then boarded a train to Florence and headed to the Duomo for a quick photo stop then straight for the Uffizi Gallery, where we had booked “Skip the line” tickets for a nominal fee. This was my 5th time in Florence, and I was finally getting to see the Uffizi. So much outstanding, famous and beautiful art to contemplate. We spent hours there soaking it all up, took some photos outside along the river, stopped for some yummy pizza, then back to the train. Yes, there was unfortunately a lot of clock-watching on my part to make sure we could do everything — and it wasn’t as laid back as I would have liked to be. But we made it happen, it was a great adventure, Kat was in awesome spirits, and I had a blast. We rolled into Genoa that evening, and instead of going straight to sleep, I hung out in the living room with Kat for a sleepover style late-night chat. Kat left for the airport 5:30 the next morning, with a stop in Paris long enough for her to enjoy the city then back to New York. What an amazing, fabulous adventure. Thanks for visiting! This entry was posted in culture, food, photography, travel and tagged expat, Florence, Genoa, genova, IB, international school, Italy, Pisa, Porto Antico, Siena, Uffizi Gallery by liguriansun. Bookmark the permalink.